If the ground clutter is too distracting, try a view from above. Visit a stock exchange trading floor today, and you’ll probably find busy, but well-behaved folks standing in front of computer docks. But back in the day, when the bell went off, a mob of folks would converge into the trading pit, and begin yelling instructions toward one another—they called it “open outcry”—waving scraps of paper and making hand signals. For a guy like me with no finance background who saw this on occasional news clips, it all seemed like utter pandemonium. How could anything productive get done in the midst of it? Now take the dynamic of that trading pit, enlarge it to the size of the whole globe, and it would approximate the world we live in. On any given day menus and sub-menus of things in your life need attention. Voices call out to you. Competing interests surround you. And just in case you get bored with your own problems, you can tune in to escalating racial tensions, gender struggles, political hatred, international crises, and global threats. It has become so bad, many of us refuse to turn on the evening news anymore. I’m one of those people. My wife likes to stay abreast of the news, but on those nights we forget to see it, I almost feel as though I’ve been spared a colonoscopy. Given the state of things, even we Christians are tempted to doubt whether this universe is under any kind of management. Do things just happen? But our universe, our world, is not only managed, but ruled, and the government that rules it is awe-inspiring. If there is an overarching government, why did the holocaust happen, and why the ongoing scourge of terrorism? Why such a panoramic array of horrors and brutality? Within the next three weeks of study, these issues are going to emerge from time to time, and I will remark upon them as much as the text justifies, and as much as I am able. In the meantime, Revelation 4:1-7 will begin to address the divine government and how everything is positioned according to it. In the first three chapters of Revelation, John had been occupied with the internal concerns of the churches, that is, things down here on earth. But now the command is to “Come up here,” from earth to heaven. This initiates the second great vision of the book, which will stretch all the way to chapter 16, verse 21. Right away we’re introduced to “a throne,” the idea of authority, the very seat of the government of God. “And he who sat there had the appearance of jasper and carnelian.” John describes God as gem-like, not only beautiful and precious, but intrinsic beauty itself. 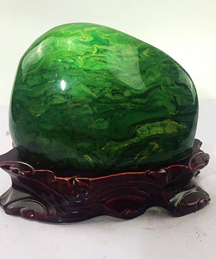 The jasper stone can be found in many colors in nature depending on its location and other elements present. Yet God refers to Himself in Hosea 14 as being evergreen—a green that stays green, regardless of the weather. It is the color of life, and where God is concerned, it signifies endless life. 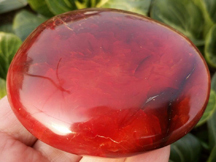 Carnelian on the other hand, is most often blood-red. By gazing upon it, we’re reminded that God has come in the Person of His Son Jesus Christ, and shed his blood for our sins, so He could communicate His life to everyone who believes in him. The One on the throne, who rules all things in the universe, is both redemptive and life-giving, self-sacrificial, and supremely generous. “…and around the throne was a rainbow that had the appearance of an emerald.” This rainbow has only one color—green—again, the color of life. It stands as a promise, much like the promise God made to Noah in Genesis 9, where he said he would never again destroy all life by a flood. Our God is a promise keeping God. At this early part of the book of Revelation, it should comfort us to know that though things will get bad later in the book, He does not hate mankind, nor intend to destroy us. “And around the throne were twenty-four thrones, and seated on the thrones were twenty-four elders, clothed in white garments, with golden crowns on their heads.” No one knows the exact identity of these twenty-four elders—whether they are human or angelic. But the number twenty-four suggests a correspondence to the twenty-four courses of priestly service and worship that David set up in his kingdom (1 Chron. 24-25). Furthermore, their crowns and thrones refer to distributed, or derived authority. God could run everything Himself, but chooses instead to share and delegate responsibility. In many things it pleases Him to involve others. Verse five says, “From the throne came flashes of lightning, and rumblings and peals of thunder.” These may have to do with the coming judgments that will be unveiled later in this book. “and before the throne were burning seven torches of fire which are the seven spirits of God.” The Greek word for torches here is lampas—lamps. Earlier they were shown on the lampstands (the churches), and they indicate the sum total of the shining of the Holy Spirit. Whether the Spirit’s illumination brings conviction in a person for repentance from sin, or the further revelation of Christ in a believer, it corresponds to the very throne of God in heaven. No sinner should ever lightly dismiss the pangs of conscience when he or she hears the gospel. Likewise no Christian should minimize their inspired moments in the Word. Both have an origin at the seat of God’s government. Verse 6 says, “and before the throne there was as it were a sea of glass like Crystal.” Not every person likes the throne of God. Though this sea sounds placid and attractive, it eventually functions as a place of judgment, mingled with fire (15:2). Later chapters of the Bible refer to it as a lake of fire. You might say that whoever or whatever fails to respond to the Holy Spirit’s shining in verse 5, ends up in the glassy sea of verse 6. “And around the throne, and on each side of the throne, are four living creatures full of eyes in front and behind. The first living creature like a lion, the second living creature like an ox, the third living creature with the face of a man, and the fourth living creature like an eagle in flight.” These creatures may be some order of heavenly being that represents the summation of God’s creation—man, beast, bird, and cattle. Everything is positioned here according to the throne—around it, before it, from it, and beside it. Although not everyone is for it. God allows the existence of all kinds of people and spiritual beings who are against His ordered government. They know He is not the kind of God who delivers a knee-jerk penalty to evil-doers. Many therefore deliberately flaunt their freedom, daring him to do something about their deeds, and even consciously work against Him, trying to damage what He’s doing. But you’ve seen an interesting dynamic play out in your own world where a product or a person receives hostile press and it actually helps them. Because of the malintent, they get a spike in popularity, or sales. No greater example of this kind of reversal exists than with God’s kingdom. A small army of scholars and rulers have tried to tear apart the Bible and stop the church, yet it has only translated into floodgates of blessing opened wide to the world. Still, this doesn’t mean God owes the sinner any thanks. World War II drove the Jewish people back to the homeland God had given them and wanted them to inhabit. But that doesn’t mean God owes Hitler any thanks. Jesus died on the cross for us, but that doesn’t mean God owes Judas Iscariot or Pontius Pilate a debt of gratitude. These individuals meant for evil to take place, and will get what’s coming to them. The point is, God’s government cannot be defeated. People can rebel against it to their own peril, but cannot restrain or overthrow it. In fact, their craftiest machinations only carve new channels for the kingdom agenda. We should ask ourselves where we stand in relation to this throne. Is God carrying out his will through your loyal, loving, believing heart? Or are you a negative foil, inadvertently advancing His plan? Hopefully, it’s the former, and you’ve come to love the One who sits upon the throne. Heaven itself erupts into praise and worship at the sight of His peerless worth. Though these elders have been exalted to stations of glory and honor, and have thrones and crowns for themselves, the greater, more compelling glory of God swallows them up to the extent that they forget themselves. None say, I might want to be careful here. I’m an elder and I’ve been around for while. I wouldn’t want to look foolish by falling down like a love-struck teenager and throwing my crown around. No, the glory has swallowed up all such self-consciousness. What was the best news you’ve ever gotten in your life? How did you feel? Some of us cried. Others shouted. Being more of an introvert, I process things internally while paralyzed with near unbelief…and then I just have to run tell somebody (Usually my wife). But while in the moment, I don’t think I’ve ever said, Aw shucks, I wouldn’t want to celebrate. I’m a dignified fifty-something. I’m too clumsy to dance, and when I smile too big, my nose looks twice its size. In the moment, I don’t care. Nor do any of us. The self-forgetfulness of our best joy shows up in full at the throne. We could stand to learn some things from how heaven worships. After all, we spend a lot of time laterally inquiring about how other churches do it. Why not switch from horizontal to vertical for a change? The most impressive lesson I receive from Revelation 4, is that the heavenly host doesn’t start by working itself into an emotional froth. Rather, everyone in that scene is responding. Those in the throne room see the excellency of God through intense focus, and then enjoy what they see in a self-forgetful manner. Brought down to our level, it sounds like our tried but true rhythm of Word-praise-thanks-Word-praise-thanks. And that’s where I’ll stop this post—with something to see and praise: A great God and His incredible government. Hopefully, that’s where you’ll start. What a beautiful post. I love your discussion of the stones and colors. God bless! Thanks, Nancy. It was a blessing to me to revisit this chapter. I’m so grateful for the Book of Revelation!